We seem to have tumbled into the New Year; 2007 has arrived with a great whoosh in every way, drama on all sides. As I sit here looking out of my window I’m wondering if the room will be blown clean off the side of the house. Such a storm is raging; trees are bending over at ninety degrees lashed from side to side. 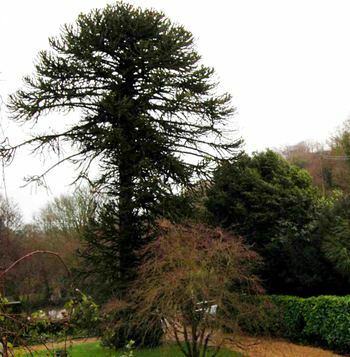 The Monkey Puzzle is doing an extraordinary swirling dance, all seventy feet of it. Oh, I do hope it stays rooted to the ground! The noise is amazing as the wind funnels its way, howling down the valley. Gusts of ninety miles an hour were recorded off the south coast according to the radio this morning….And January usually cheers me up after the dark dank days of November and December. But this year, so wet and wild, even the carpet of snowdrops, early camellias and smiling hellebores fail to give my spirits the usual lift. I hope things improve before lambing begins. We’re starting earlier this year in anticipation of another long hot summer! Fat Ladies in Waiting graze the hillside and race rudely to the yard for afternoon tea.